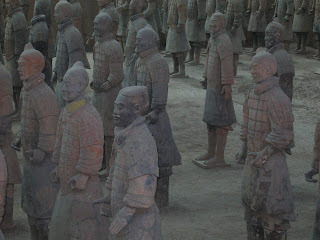 and the corny one... reproducing terra cotta warriors ha ha. By the end we were jaded by the process (pun intended) due to a disturbing experience we had at the jade factory. We were led to a room of Jade carvers to watch them do their work. As we all oohed and ahed and took pictures the workers looked bored yet focused as if they have been doing that work for ten hours straight. But as soon as we left they left too!! (Dan and I went back to peek in the room and to our dismay we found it empty). It was clearly just a gimmick. It was no jade factory! 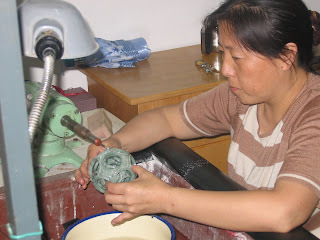 A jade factory worker "hard at work"
The attractions are not the only thing planned to a 't'. The meals are planned too. Restaurants do plenty of business serving only tourist groups. We are brought to a restaurant, told to sit at two tables and then served... an identical meal every single time. 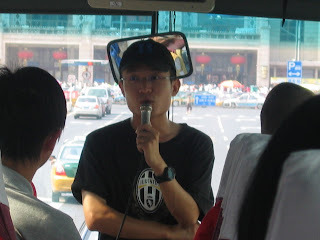 (Beijing meals in particular were identical). It is served on a large lazy Susan in the middle of the table which we tactfully try to spin to reach the dish we want. 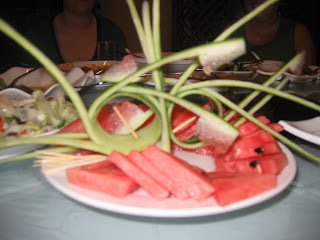 The meal starts with a small dish of cold sliced pork followed by many other dishes that all run together in my mind due to their blandness and at the end when it is now completely useless to us they bring a bowl of rice and finally dessert- a platter of seeded watermelon. Needless to say, we all lost a lot of weight on this trip. Dessert. This was the only one served with an artistic design. Very cute though, you've got to admit.